Home Blog Will Breast Implants Interfere with Mammograms? This question is a common concern among women interested in breast augmentation, but you can rest assured knowing that a mammogram can be effectively completed on breasts with implants. Experienced radiologists can examine an augmented breast by using specialized techniques, but the specific method used will depend on the breast implant placement (above or below the pectoral muscle). “Implant displacement” is typically the best approach for patients who have breast implants that are below the chest muscle. Using this method, the radiologist can push the implant back along the patient’s chest wall while pulling the breast tissue forward to capture four images (in addition to the four standard x-ray views). In some rare cases, the implants might continue to obstruct the views too much. In these situations, the radiologist may require an MRI, instead. To ensure the success of your mammogram and protect the integrity of your breast implants, Dr. Jon Paul Trevisani strongly recommends conducting thorough research to locate a hospital or clinic that is experienced in performing these types of mammograms. 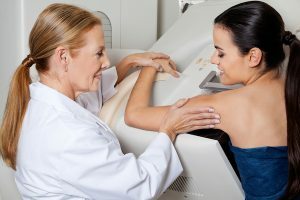 It is also important to mention your implants when scheduling your mammogram, as well as when you check in for your appointment — these extra steps can help the radiologist properly prepare for your mammogram and ultimately provide you with the safest, most accurate mammogram possible.